I always stay in Ambleside because I like to 'Go Green' one friend announced when I asked interestedly where she'd stay on her trip to Cumbria. The bustling pavements of one of the Lake Districts honey-spots didn't sit easily, at first, with my conceptions of a 'Go Green' vacation. But, as, I listened to her I began to see that she was quite right. 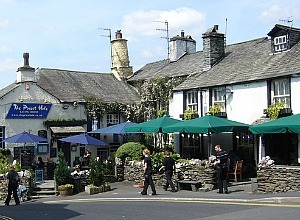 Since then many others, have told me why Ambleside hits the spot as the Perfect Holiday Location. The top reason my friends' tell me, that they choose Ambleside is, that it has everything you need for a holiday in the Lakes. Walks from the door, a nearby Lake, great cafe's and traditional pubs. Surely this is Green Tourism at its best. Once you've arrived at your accommodation you can park your car and not need to use it again until you leave. Bridge House (top photo), which straddles Stock Ghyll, never fails to impress. Now owned by the National Trust, this attractive building must surely be one of the Lake District's most photographed and painted locations. As a child I loved to imagine who might once have lived in there, and remember always being terribly disappointed that it wasn't open to the public. Local sources say it was once an Apple Store for nearby Ambleside Hall. Why it was built over the river, I still don't know. If you're buzzing to explore the countryside, several places hire moutain bikes here, in Ambleside. These are best booked ahead at peak periods: Ghyll Side Cycles and Bike Treks are in the town and U-Can-Do are based by the YHA at Waterhead on the edge of Windermere. If you fancy dabbling on the water then U-Can-Do also hire out canoes and sit-on kayaks. If you are travelling with teenagers, in fact with cinema lovers of any age, then you'll be pleased to discover Ambleside cinema, Zeffirellis with attached pizzeria is easily accessible in the town centre. This pretty town is practically over run with boutique gift shops. Although I proclaim to hate being anywhere other than up on the fells or on the one of the lakes, the truth is, you may sometimes find me nosying in the Estate Agent's window here or having a crafty peak into Ambleside's 50 year old independent bookshop, too! Hiking and camping shops are in abundance. Once prompting my Brother-in-Law to declare Ambleside the best place to get kitted out for the fells. Reasoning that the sheer number of hiking and outdoor shops in Ambleside must surely keep the price competitive! Now I can't vouch that you will get the best price for your outdoor gear in Ambleside - but you will certainly get a fabulous choice and have plenty of shops to do your own price comparison! There is a fine choice of places to eat in Ambleside. One of our favourite Ambleside Cafes is Rattle Gill. Its very name conjures up quirky expectations and if you bend your head and duck up through the ginnel off Rydal Road you'll find yourself by the river at The Rattle Gill Cafe - a truly wonderful find, especially if you are vegetarian and embrace proper good home made food. Non-vegetarians may prefer to potter over to the other side of the river, where you will find another of Ambleside's hidden treasures - The Giggling Goose - they don't have a website, but you can find out more about them on their facebook page. With the river gushing past it is easy to see why this mill was positioned here and if the weather is nice this is a great place to relax as there is lots of outdoor seating. If its a good mug of tea and a proper breakfast and a chat with other ramblers and climbers you are after, then Bilbo's Cafe is just above one of the shops behind Barclay's bank. The unpretentious ambience wins as many accolades from its visitors as the food! Its a tradition on the last Thursday of each July for the residents of Ambleside to head to Rydal Park, for The Ambleside Sports event and visitors to Ambleside are very much welcomed. The Sports have evolved over the years and now include race track and cycling events alongside more traditional fell races and Hound Trails. You'll find a beer tent and several other trade and craft stalls including a 'Made in Cumbria' stall. Step off the high street and within a few minutes you will be at this 'kissing gate' leading you into another world. 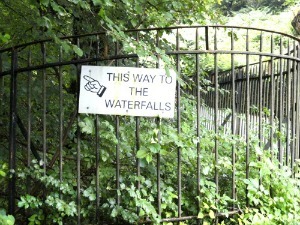 This waterfall is called Stock Ghyll and is a very short easy walk, along a well defined path. There is an easy access viewing point which is wheel-chair and push-chair friendly. There is also a money tree to discover on the walk! 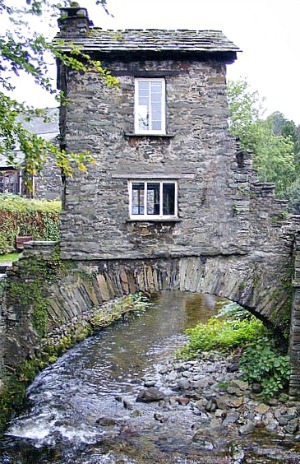 Read more about this Ambleside walk. Looking for a fabulous spot for lunch?